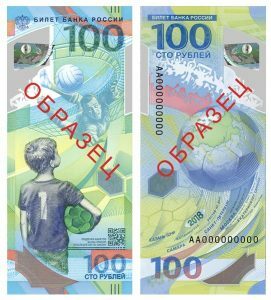 The Bank of Russia has presented a commemorative polymer 100 ruble-banknote for the 2018 World Cup. The circulation of banknotes is 20 mln and by the end of June they will be spread in all regions of Russia. The artistic composition on the front side of the banknote symbolizes the continuity of generations. It depicts a boy who dreams of repeating the achievements of great players, such as goalkeeper Lev Yashin. The reverse side of the banknote carries a flying soccer ball, symbolizing the globe with the map of Russia highlighted on it. Below the cities which host the matches of the 2018 World Cup are written. The images on both sides are vertically-oriented. The commemorative banknote will be a legitimate means of payment.